Months before the film actually begins, Virginia Wainwright suffers a traumatic car accident that still causes her to have physical and mental issues. However, her life seems to be back to normal and she is blessed to be part of the elite "Crawford 10" at her high school; these are the students who are most popular and involved on this prestigious campus. Her eighteenth birthday is approaching, but rather than be joyous celebration, it becomes a nightmare as a mysterious killer begins gruesomely murdering her friends. 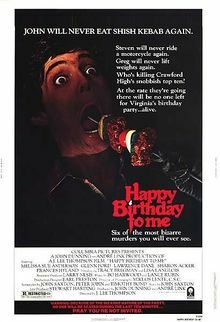 Happy Birthday to Me is one of the most ambitious and well acted slasher films of the 1980's. One of the main reasons that it never enjoyed the impact or success films such as Prom Night or Friday the 13th, which were released around the same time, is that it was a tad too ambitious and clever for its time, as it was released at a point where gore and body count is what made a slasher succeed. While Happy Birthday To Me does have its share of gruesome murders, the film relies more on driving a complicated and surprising plot and developing the characters. Melissa Sue Anderson gives a excellent performance as our heroine, and the rest of the cast also turn in memorable performances. The pacing of the films lags a bit in parts, as the murders are spread out through the film. It is the film's climax that is certainly the most memorable, and for many, the most confusing part of the film. It strays so far from the traditional identity-of-the-killer reveals and confrontation scenes of the time that it will leave many scratching their heads and others smiling ear to ear at its ambition and brilliance. Admittedly, it is a divisive ending that will either be loved or hated, but the film definitely scores points for originality. Perhaps the ending was too ahead of its time since it is very reminiscent of something that would be seen in the slasher films of today as an attempt to be clever and unique. Certainly, the ending cannot forgive some of the films major flaws. The biggest issue with the film is the lackluster directing. There is no directorial flare or style that elevated films such My Bloody Valentine, Terror Train, and even Halloween 2 to something beyond a brainless horror film. The directing in Happy Birthday To Me is more appropriate for a soap opera, and J. Lee Thompson squandered many chances at creating atmosphere and giving the film an proper tone. Still, Happy Birthday To Me remains a standout among other films released in the early 80's. From Melissa Sue Anderson's marvelous performance to the creative murder sequences to the almost dreamlike ending that will surely piss some viewers off, it is a film that any proclaimed slasher film fan should make an attempt to see. Sadly, it is also a film that probably suffered due to being too ahead of its time.